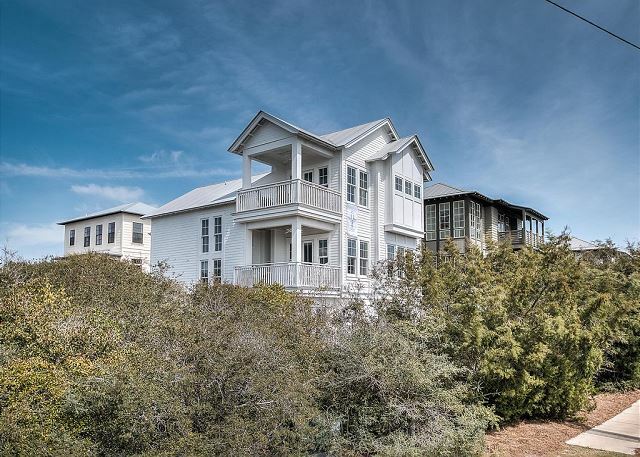 Come enjoy WhiteBird 30A, a home located in the luxurious gated community of Seanest Village, conveniently located on 30A in the heart of Seagrove Beach! 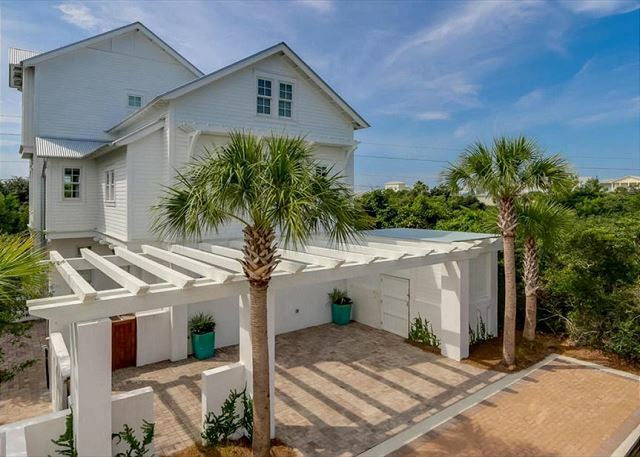 This roomy and strikingly modern-day 4 bedroom, 3.5 bath property will sleep up to 15 people and is an amazing 90-second walk to the beach! 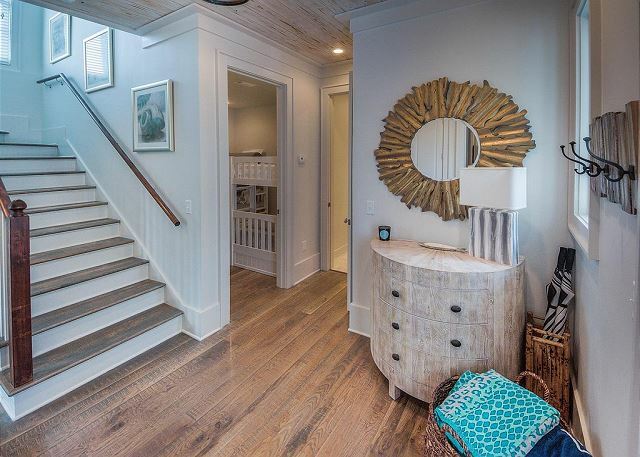 This beautiful neighborhood is conveniently located less than two miles to both Seaside and Watercolor – so it is a short walk, bike or drive to fun family activities, delicious restaurants, and desirable boutiques in the surrounding communities. 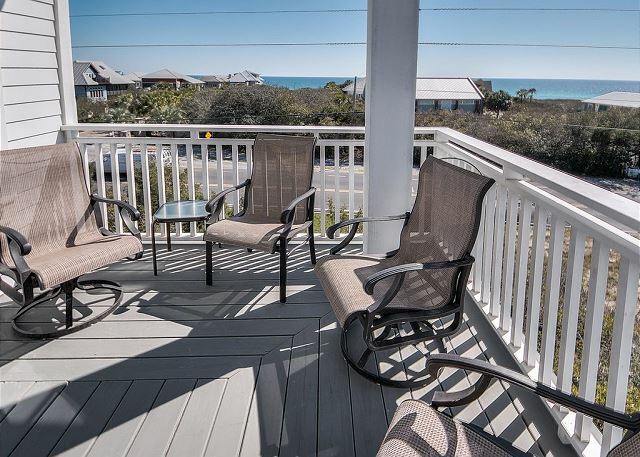 The very short walk to the beach is via your own private, reserved boardwalk access. 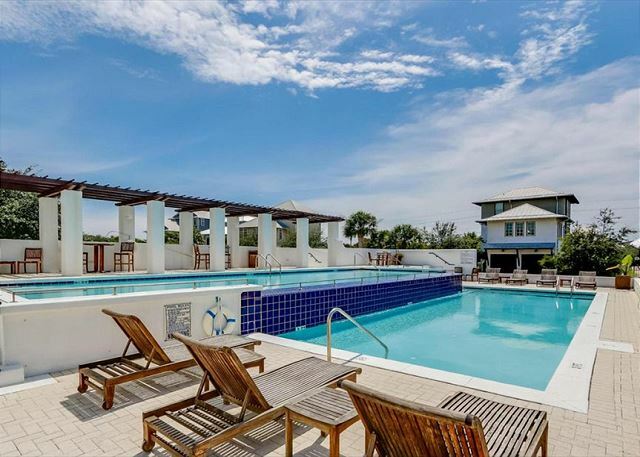 The moment you enter the secluded gated community of Sea Nest Village, you immediately feel an immense sense of relaxation as you pass by the beautiful, infinity design community pool with arbors for entertaining and relaxing. As you pull under the awning of WhiteBird, you realize every inch of this elegant home is breathtaking; the designer spared no expense, and took advantage of all angles to provide maximum views of the area and the Gulf. Upon arriving at the property, you are greeted with an outdoor patio area with an outside shower, perfect for relaxing outdoors before or after your day at the beach. 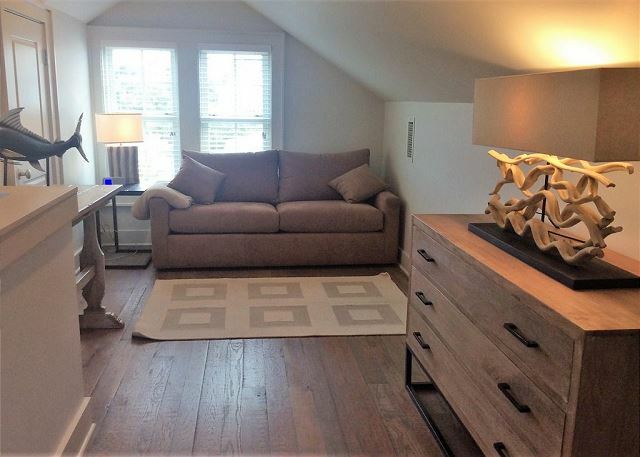 Upon entering the home on the first floor, you will discover three full bedrooms with two large bathrooms. One bedroom is a mini-master with a comfortable queen bed and ensuite full bath. 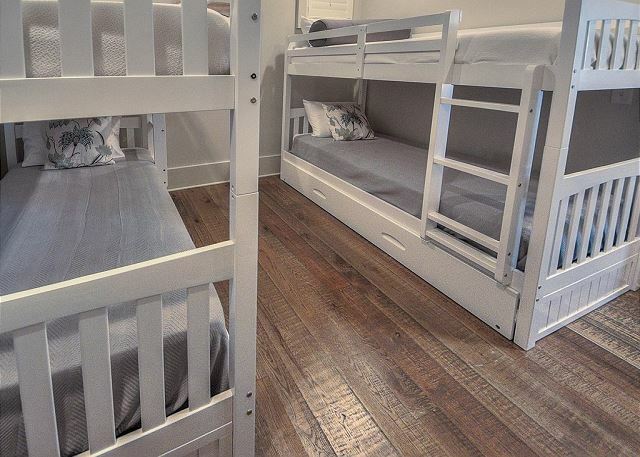 A second bedroom also has a comfortable queen bed while the third bedroom has two twin bunks, one with a pull-out twin trundle, sleeping a maximum of five (and up to 9 on the first floor!) 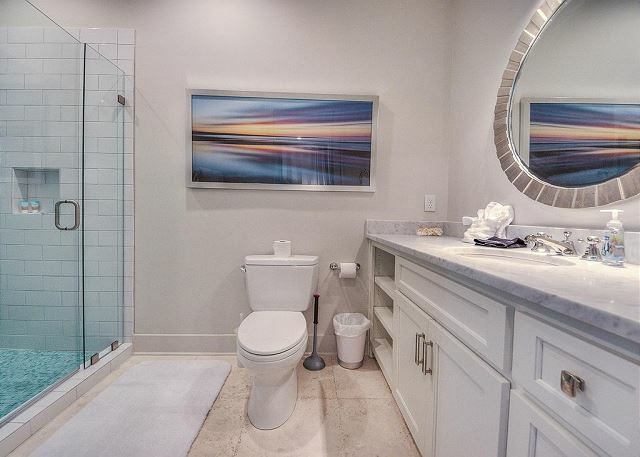 The second and third bedrooms share a large bath with double sinks and large shower. 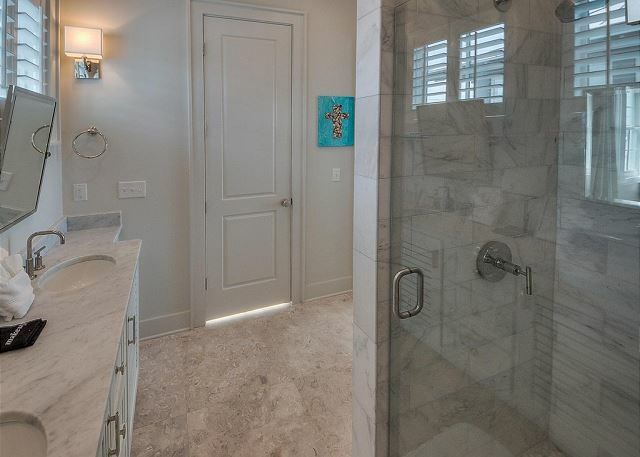 As you walk up to the second floor, you are greeted with a large open-concept family area welcoming you with beautiful Gulf views, an oversized kitchen island, and a large family room for all of your entertaining and lounging needs. Stepping outside from the living area, you enter a covered balcony, providing easy and comfortable viewing of glorious sunsets or a relaxing area to enjoy morning coffee. 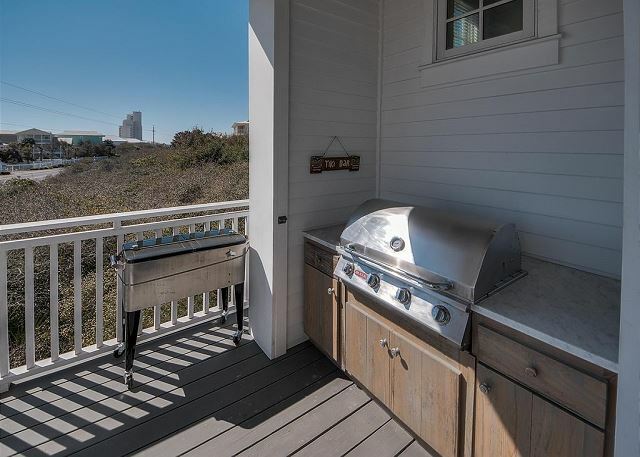 Located on this balcony is also a gas grill should you decide to cook as you watch the sun go down. There is a queen sleeper sofa with a temper-pedic mattress in the family room with convenient access to a bath & laundry room off the kitchen plus another oversized sofa for that afternoon nap. Moving up to the third floor, you step into a second lounging area outfitted with another queen sleeper sofa, also with a temper-pedic mattress. The master suite, also on the third floor, has a spacious king bed and large master bathroom with double vanity, glass enclosed shower, plus a large closet for all of your hanging & storing needs throughout the week. The private master balcony has serene views of the ocean by day and unbelievable sunsets by night. Each room is outfitted with a flat screen TV’s; the kitchen is fully stocked; plenty of DVD movies, board games, and Apple TV, SONOS Sound System, as well as $200 Live Well beach amenity credit and a kayak for your family’s enjoyment! There is also a walk-in laundry room with a full-sized washer and dryer and a wine cooler for you to use at your convenience during your stay. 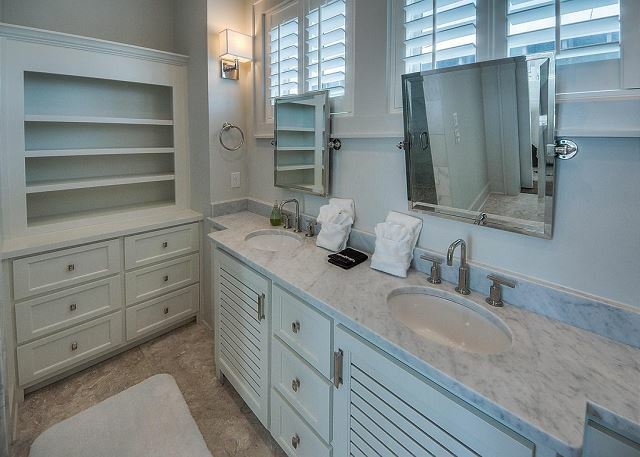 With all the beautiful amenities at WhiteBird 30A, all that is missing is you and the memories you and your guests will make during your amazing beach getaway vacation! Large, Open Concept Living Area with Dining for 7 at the table, and another 6 at the oversized kitchen island! 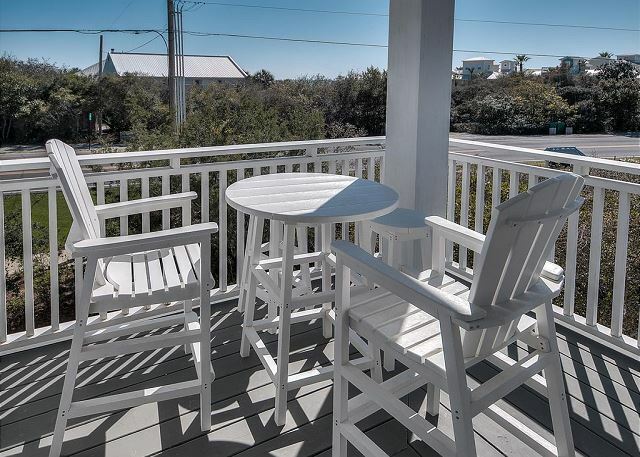 Lounging Porch with Great View of the Beach + Outdoor seating & table for 4 more guests! The home was stunning, close to everything. After living without power,cable,and most everyday convinces this stay was heaven. A short stay in the normal world after hurricane Michael was what we all needed. The house was alll we expected and more. We will definitely be back. Thank you for your review Pat and we were so glad we could help you find some normal again! This property is truly wonderful - it is a great place to relax and enjoy time with family and friends. 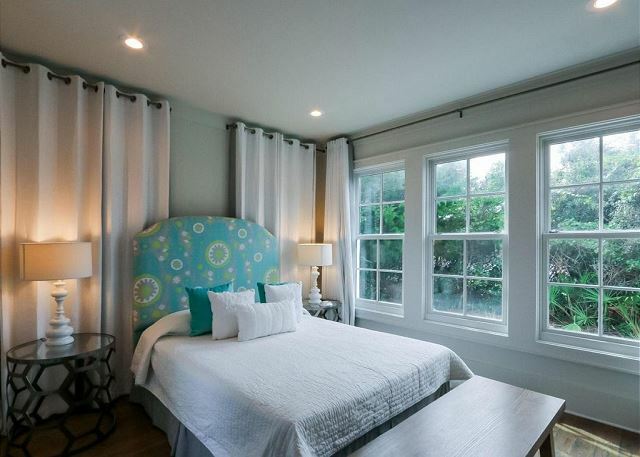 It is very conveniently located - close to the area's fine dining, shopping, and of course the beach! Please call Benchmark today and let us show you all that 30A and Whitebird have to offer! Our family had a wonderful time at Whitebird 30. 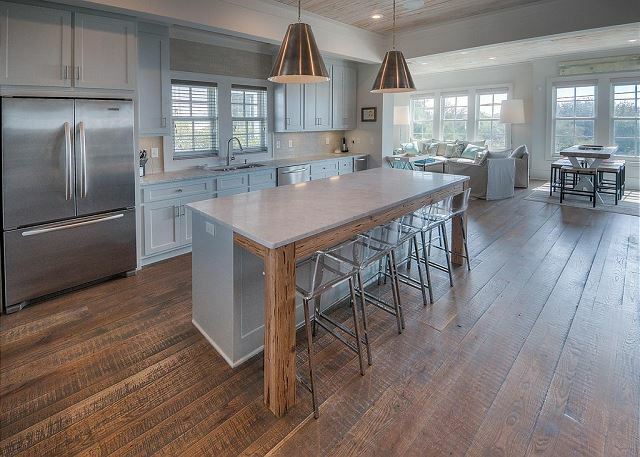 Great location and just a few days after Hurricane Michael it was in perfect shape, a lovely home. Didn’t have cable due to hurricane but no tv access was a gift — more conversation! Would recommend highly for anyone with kids especially. Thank you for submitting your review - and we can't tell you how much we appreciate your attitude about cable/internet! We were so very lucky along 30A to have weathered the hurricane without much damage but re-establishing some of the services such as internet and cable has been a challenge. Those men and women have been working around the clock for weeks now to help us regain the use of those services and we are so grateful! 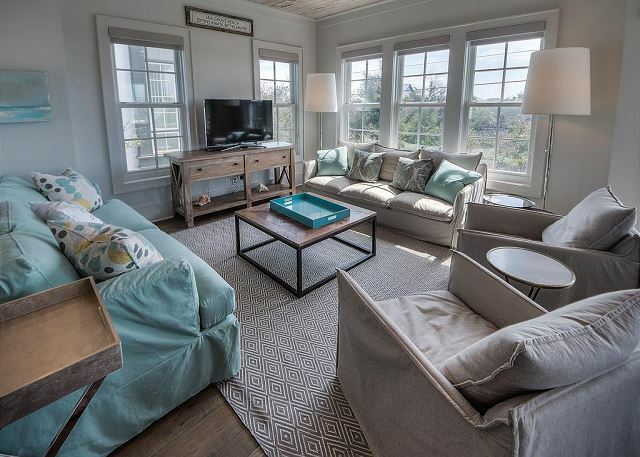 Thank you for visiting us and spending time at Whitebird 30A - this home is truly a beauty! Located in a wonderful neighborhood with a great community pool and just a quick walk to the beach it has everything you might desire for a relaxing and memorable beach vacation! 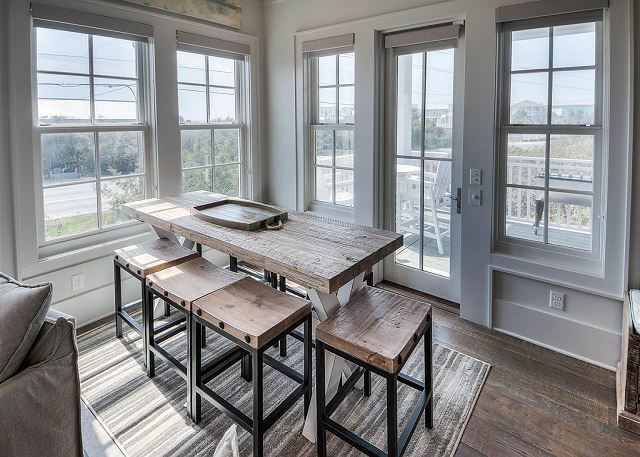 Call Benchmark today and we can help you set up the perfect stay on 30A - don't delay! We had a wonderful stay at Whitebird. From the time you walk in to the home, you immediately feel relaxed. The kitchen is fully functional for a large group of people which was probably our favorite part aside from the patios. All of the small details like having a basket full of beach towels to welcoming us with some fun swag items made the stay all the more enjoyable. White Bird was better in person than in the pictures. It’s a beautiful home. For the 12 ladies that stayed, it exceeded our expectations. Everything was so close to the home, the pool and the beach. I cannot say enough about this place and the easy communication with the rental company. We definitely plan to be back for future trips! My friends and I thoroughly enjoyed our stay at Whitebird on 30A. It was within walking distance to the beach, had a big kitchen with plenty of dishes and cooking utencils, had beautifully-decorated rooms and a washer and dryer for our use. We were glad to have chosen this rental! This house exceeded expectations! Its beautiful! Easily slept 12 of us! Will book again when we vacation in that area of Florida!! Thank you for taking the time to submit your review! We are so glad you enjoyed your stay at WhiteBird! Isn't it just lovely?? Settled back in a quiet part of the gated neighborhood you can relax in the outdoor seating area or head just across the street to the pool! Ready to feel the sand under your toes? Just a quick walk across Highway 30A and you find your access to the pearly white sandy beaches of the Gulf! Whether you decide to stay in and cook a family meal together or travel to one of the fine dining establishments nearby there is something to make everyone happy! Call Benchmark today for your 5 star experience at WhiteBird! We enjoyed a wonderful stay at Whitebird 30A. The house is beautiful and very clean and well cared for. We had a full house - 7 adults and 6 children - but there was room for us all to spread out and have space. A couple of suggestions would be to replace old pots and pans (the teflon is coming off) and cookie sheets. Also, more dish towels and cloths and pillow cases. There were lots of extra pillows, but no cases. Otherwise, everything was great! Thanks! Thank you for taking the time to submit a review - all of your comments and suggestions are much appreciated! This home truly is amazing! Lots of space and a place for everyone - inside or outside! There is a great outdoor space for evening cocktails or morning coffee! We will look into the need to replace some of the kitchen items and will ensure there are enough pillow cases for all! 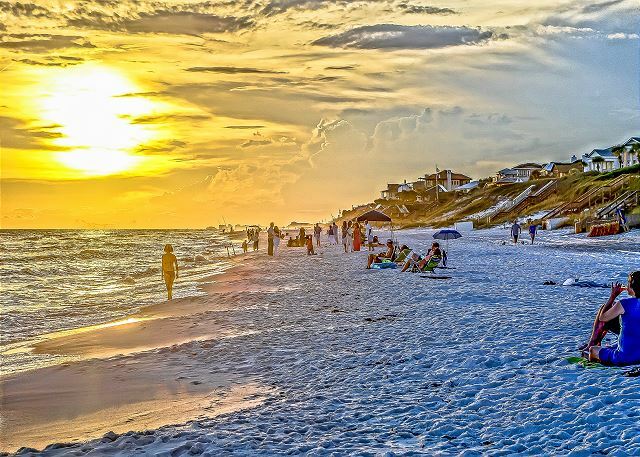 WhiteBird30A is a great place to stay - a short walk to the beach - just across 30A and you will be on some of the most beautiful sand in the world. Then you can spend the evening at the pool where you can enjoy the unique waterfall! This home is located in the area known as Sea Nest - quiet and safe as it is gated - no worries at WhiteBird - call Benchmark today for your reservation! 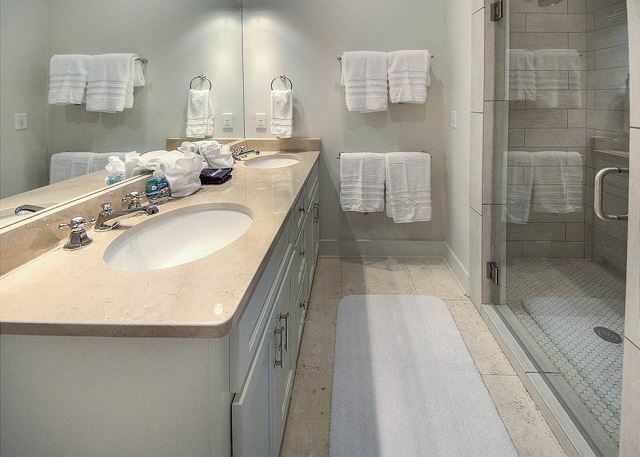 Whitebird is a gorgeous home and every detail has been considered. The layout was perfect, kitchen amazing and we thoroughly enjoyed our week there. Thank you for submitting your review! 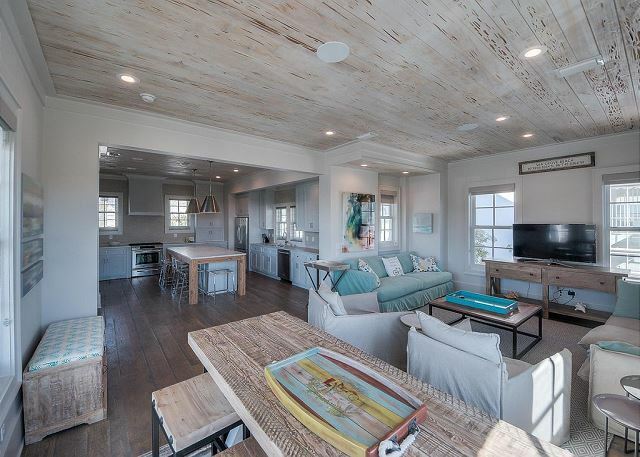 We agree - it's hard to find a more perfect vacation spot than Whitebird 30A! This home is so comfortable and the owner has put much thought into making sure you are able to relax and enjoy! 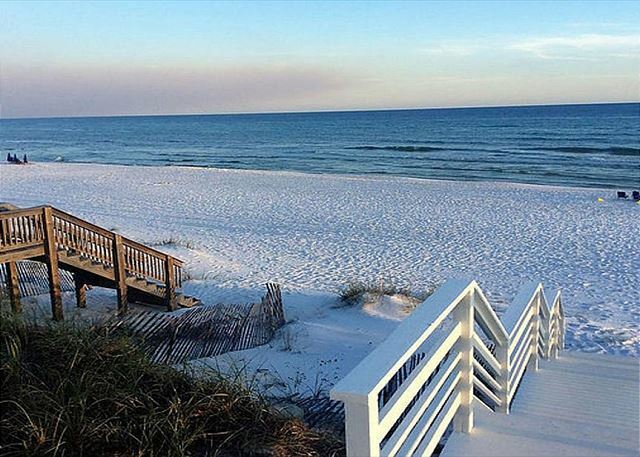 The beach access is just across the street so it only takes minutes to get to the sandy shores of the Gulf! 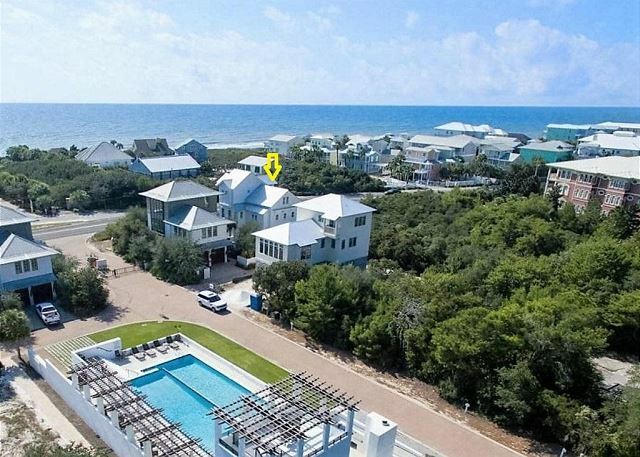 This home is very popular so call today to experience the wonder of Whitebird 30A! This beach house far exceeded my expectations! I knew that it looked amazing in the pictures online, but in person it was truly even more amazing! The location is great, and is directly across from the beach. It is very well decorated. Just an amazing house that I definetly plan to rent again! Thank you for submitting your review - we appreciate your kind words! This is such a great property! You didn't mention the pool but it is definitely worth mentioning! Want to feel like you are relaxing at the spa? Of course you do so come on down! 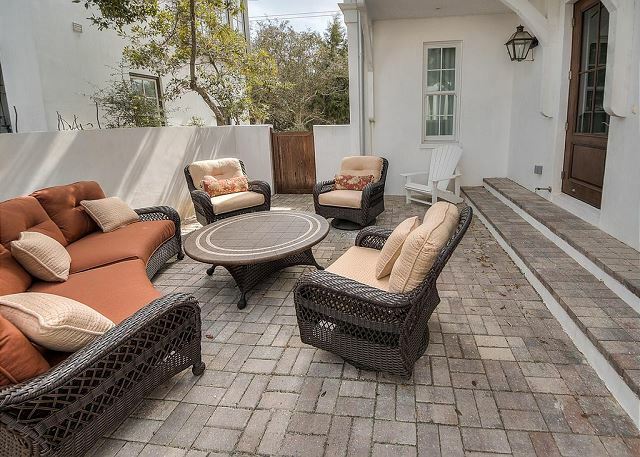 The pool for this property is amazing and the beach is a very short walk across 30A. The location is very convenient and the little community is gated so you can feel safe and secure while relaxing in the wonderful outdoor space! 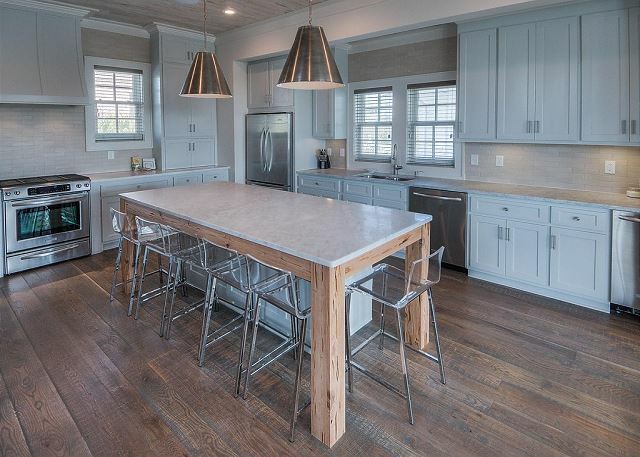 Whitebird 30A is a gem - come experience it soon! We had an amazing week at Whitebird 30A. We all 6 said best house we have ever stayed at. The big kids and little ones loved the kayak and all of them rode bikes during the stay. The house is better than described and was wonderful for grandparents our children and grandchildren. Thank you so much for submitting your review! This truly is what it's all about here at 30A - spending time with family and making memories that will last a lifetime! This home is a wonderful place to relax with all of your family members and the location is great when you are ready for some biking adventures! And the pool - fantastic! Want to bath in the sunlight and feel like you are at the spa then this is the place for you! 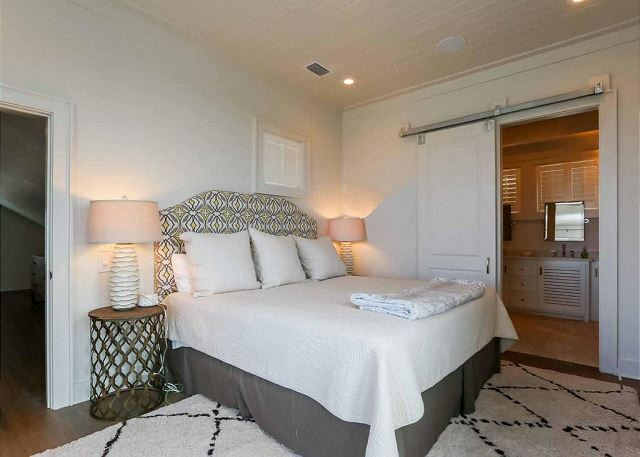 Whitebird 30A is a wonderful choice for your beach vacation!